Retirement from nursing has been a mixed blessing. As my memories fade of those hellishly busy days in the ER, when hours flew by with barely even time to pee, I find myself, oddly enough, almost missing the place. No, I don’t miss the abusive drunks or the manipulative drug seekers. And I especially don’t miss the pungent scent of the great unwashed. But I do, occasionally, miss the entertaining cast of characters I no longer encounter in my sanitized world of manicured lawns and homogenized suburbs. Where else would I have crossed paths with someone as sweet as Bob? Bob was old. Really old. He had served in WWI, or so he claimed. He was a lovely man with endless stories to tell. After the paramedics dropped him off, I checked his blood pressure and hooked him up to the monitor in one of our exam rooms closest to the nursing station. Smiling a toothless, devilish grin, Bob winked and serenaded me with songs from the Great War. He had a severe tremor in both hands and was extremely hard of hearing. It looked as if he hadn’t been shaved in a few days but, otherwise, appeared to have been well taken care of. How could you not take good care of Bob? He was so sweet. I would have loved to spend more time with him but I had other patients waiting for me as well. I needed to check a urine sample so I handed Bob the urinal, tucked the covers up under his chin, and pulled the curtain to give him some privacy. I was back at the nursing station, catching up on charting, when I heard Bob calling for me. Before I had a chance to get up from my chair, Maggie, our eager, young new grad, passed by Bob’s room and poked her head behind the curtain. Seconds later, she rushed out of the room, looking absolutely horrified. Maggie’s face was as red as the emergency crash cart parked at the end of the hall. “What’s wrong?” I asked. I couldn’t imagine what Bob could have done to upset her like that. “Maggie, just tell me what’s wrong,” I said as I headed towards Bob’s room. Afraid of what I would find, I stepped into his room and pulled back the curtain. There was Bob, exactly as I had left him, with the covers pulled up to his chin. Still holding the urinal in place, his right hand was shaking vigorously under the sheet with tremors as strong as ever. “Nurse, am I doing this right?” he asked. Fighting hard not to laugh, I assured Bob that, yes, he was doing just fine. I would check back shortly to get his urine sample. I barely made it out of his room before I burst out laughing. Maggie, still looking shocked and embarrassed, was waiting for me in the hall. “Did you see what he was doing?” she asked. By now, some of the staff had joined us at the desk, snickering and laughing as they caught on to what had happened. Maggie looked even more embarrassed. “And anyway, if he really was beating off, why did you think I would be better at helping him than you?” I asked. Image | This entry was posted in Nursing and tagged geriatrics, nursing, urine sample. Bookmark the permalink. I love hearing your nursing stories and I’m sure you have a ton of them. Please keep them coming. 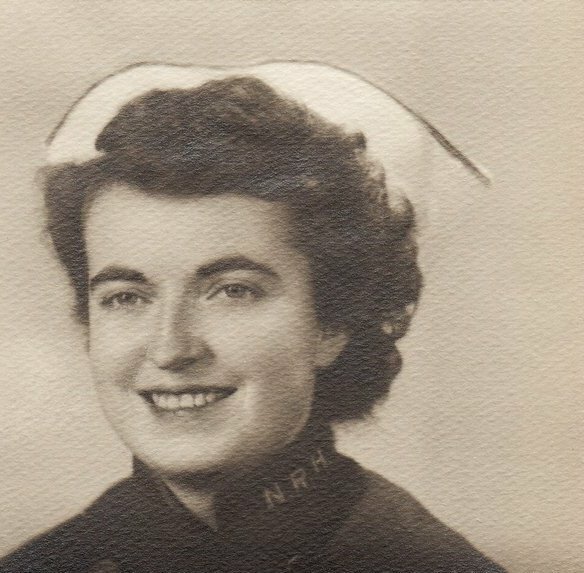 This photo is of the woman who inspired me to become an ER nurse – my mother. Just found your blog…love it. Thanks Laura. I really appreciate that. Can I ask how you found my blog? I am new to this and am still a bit clueless. Basically, I clicked on your name on a comment you made on someone’s post I found interesting…can’t remember the website, sorry! Because you are wp.com (I am wp.org) you have the possibility of being ‘found’ by the ‘freshly pressed’ lurkers…which I’m told increases readership immensely. Until then, it’s good to comment on other blogs to try to get your name around, etc.